I must start of with Caroline as her snapchats recently have just made me literally cry with laughter. I'm not sure what I love more about her snapchats, her fab Irish accent, her hilariously sarcastic humor, or just her updates about her day. Caroline is currently writing her own musical and is also someone who's crazy talented so if you're interested in finding out about a new musical or just love the Irish humor then Caroline is definitely one to follow. I absolutely love pretty little liars and follow all of the girls on social media but Shay's snapchat is definitely one of my favorite accounts. She is just such a beaut, her fashion sense is fab, she's also absolutely hilarious and is a total babe in general. I'd definitely recommend following her. I absolutely adore Anna. I just think she is one of the loveliest people ever and her family are just so beautiful. I love following to her to see what she gets up too and I love seeing her kids appear on her snapchat as well as they are just so cute and funny. Anna is currently pregnant with her third child as well so following that journey on snapchat too is also so beautiful to watch. If you're not following her then where have you been? Ellen is one of the most famous ladies on the planet but I absolutely love watching her shows and then I discovered very recently that she has snapchat and I just love watching it to see the behind the scenes features of what goes on during and even before or after one of her shows. One day I will be in that audience! Definitely follow her account if you're not already. When it comes to the kardashions and the jenners I am definitely not the biggest fans. I personally go not get the hype at all but I decided to follow her on snapchat and I absolutely love it. At the moment she's released her valentines collection of all her lipkits and they all look absolutely amazing so if you're not aware of that or do not follow her then I highly recommend it just to see them as they are so pretty. She is also pretty funny too and I love the banter she has with her family too. It's definitely one of those accounts that's a guilty pleasure. Kayleigh is a blogger over at couturegirl and is an absolute babe. Her snapchats are a mixture of the most stunning blogger events, snaps of her stunning home (serious house goals! ), snaps of evenings and nights out with her friends and boyfriends, the occasional outfit post and of course the ever so popular blogger mail hauls over on instagram. I've been following Kayleigh for almost 5 years now and she's one of the loveliest of girls and her snapchats are always interesting so I'd highly recommend following her. Em is definitely one of my favorite bloggers and all her social media is worth following but I just love her snapchats. They are always full of delicious food, fabulous outfits, amazing fitness clothes and work out routines, incredible places to travel too (she's always in the most stunning of places around the world), beautiful hotels and of course the occasional blogger mail haul too which is always good to get some inspiration from especially at the moment Valentines Day and Mother's Day are coming up. She's just a total babe too and one of the loveliest most supportive bloggers I've ever come across. So there are just a few snapchat accounts I believe you should be following. I just think snapchat is the perfect app to share and watch snippets of other people's days and see what they get up too. It's such a fab and fun little app. Yes the dog filter is slightly irritating (probably the only girl who says that but I don't like it okay) but if you look past that it is a great little app for keeping up with your favorite people in real time. I am starting to use snapchat a little more at the moment so be sure to head over and follow me at fleur_danielle. 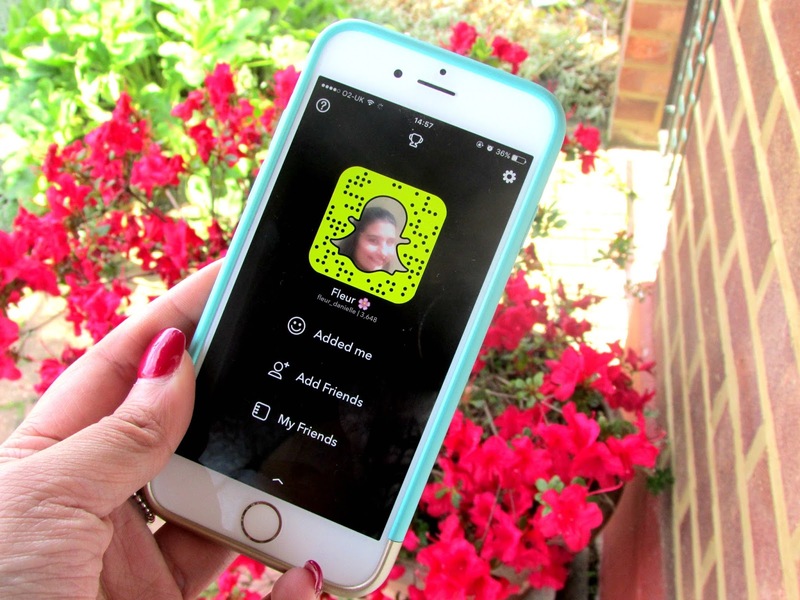 Make sure to leave your snapchat names below as well as I am always looking for new people to follow especially when it comes to bloggers. Do you follow any of these people on snapchat?